Last week I was reconnected with my sewing machine after she had been away for two weeks having a much needed service. 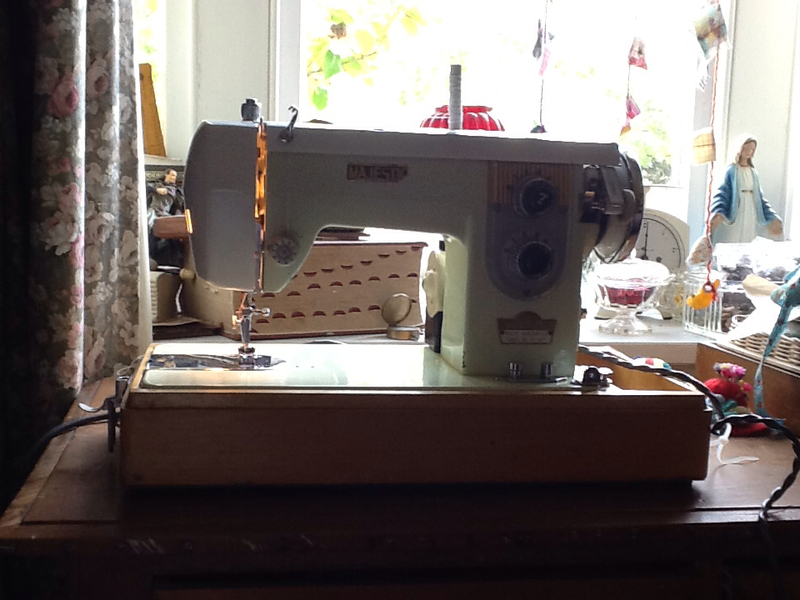 This photo is not her however, this is my new old machine I've named Bertha. For years now I've been on the look out for an older machine that is able to do the heavier work of sewing thick fabric. I've had some close encounters with old machines that have rather large price tags or some just didn't work properly but today the search has ended. This morning I was out pootling around going to and from garage sales when I chanced upon her. No it was not at a garage sale but as i was approaching one I saw her sitting on the curb amongst some rubbish. I quickly pulled over for a look and there on the top was a note saying "it works". I didn't even bother looking under the lid, it was grab and run, well not exactly run more like a waddle as she is very very heavy. I heaved her into the car, I said thank you to the house that she was sitting in front of and continued pootling along on my merry way to the next sale. When I got home I had a peek underneath the cover to discover that she was a charming vintage cream and green. I then spent a bit of time working out how to thread her correctly before plugging her in and found that we had power, so far so good. Now for the main event, I then applied a bit of pressure on the foot and we were away, sewing happily. I was delighted with the soft purr of her engine as she motored smoothly along, she worked like a dream. I can't believe my luck in finding the Majestic Miss Bertha. Now I have no excuse to get cracking on with the sewing, I'm still without my computer though, it might be time for an upgrade. oh look at her all aglow!....what a great bit of spotting there mrs. the eagle eye! how nice they put a note on top. Have fun. You can't beat those older heavy sewing machines for precision in stitching. Isn't she a looker! Happy stitching. You scored that on a kerbside. wow. she is a beauty.